Appidi Energy Recovery Units (ERU) heat recovery is a plate or rotary type air-to-air heat exchange designed to provide maximum energy efficiency in ventilated systems where heated or cooled air is let out and outdoor air is let in. In applications where ventilation is required or recycling of the same air is not allowed, energy recovery wheels or plate heat exchangers are used to recover the energy from exhaust air. This reduces the initial investment in HVAC equipment and minimises operating costs. Since HVAC equipment is typically the largest source of energy consumption in commercial buildings, ERU investments are economically justified for outdoor air makeup. In new HVAC installations ERUs also allow ventilated systems to be sized with smaller compressors, lowering initial costs of the HVAC package. 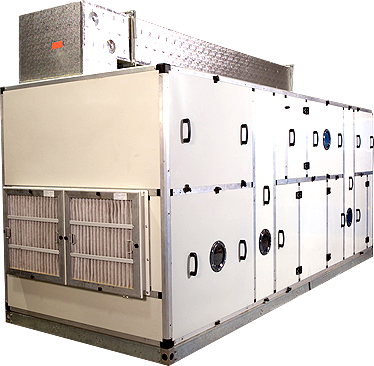 The highest form of thermal energy recovery system in air handling systems is the rotary heat exchanger. There is no other system of energy recovery that can deliver high efficiencies with high air volumes in limited room spaces. The rotor which is constructed like a honey comb rotates non-stop between the streams of cold air and hot air. 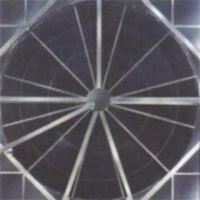 The rotor is cooled up to 80% of the cooling and humidity contained in the air. Then the cooling is transferred to the hot supply air coming from ambient to the rooms. This kind of rotor has hygroscopic surface, which is supports the transfer of moisture. Rotors of this type have a high hygroscopic coating which allows high sensible and latent efficiencies year round. Epoxy coated rotors In order to increase corrosion resistance; rotary heat exchangers are also coiled out of epoxy-coated aluminium foil. It is quite impossible to imagine today\\\'s large sized paint booths in the automotive industry without heat recovery systems. The economic benefits are indisputable. Paint application systems are in constant use, maintenance intervals are growing and this requires heat recovery systems with high standards of operational safety. Machine finished real counter flow heat exchangers with channelled airflow guides made from sea water resistance aluminium to achieve higher efficiencies over the entire volumetric spectrum. Air-conditioning units, controlled accommodation ventilation, warmth recovery in winter and cooling recovery in summer. The two air streams are conducted past each other along thin parallel aluminium plates according to the counter flow principle. Up to 90% of the heat in the exhaust air is transferred to the ingoing air, without any smells or humidity being exchanged. Distribution of airflow though definite channelled guides, thus ensuring high performances by simultaneous low pressure losses over the entire volumetric spectrum. 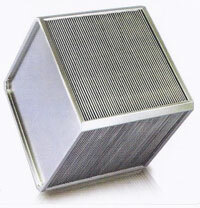 The plate heat exchanger consists of a plate stack composed of advantageously circular grooved plates, welded together. The clearances between the plates form flow ducts for flows of a heat-supplying medium and a heat-receiving medium. The plates are provided with holes which form inlet and outlet channels for the flows of the heat transfer media. At least one of the holes on the plates is located substantially in the centre of the plate. 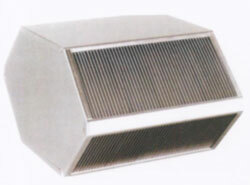 The plate heat exchanger operates on the cross flow principle. When the plate heat exchanger is provided with a partly opened mantle which connects the end plates together, and the central channel is provided with a partly opened pipe to control the flows, the plate heat exchanger is made to function both on the counter flow principle and the forward flow principle. The outside air and the inside air are completely separate from each other.